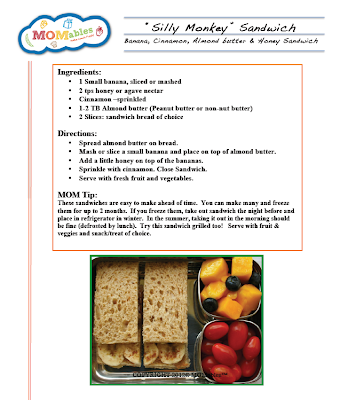 Gluten Free & Allergy Friendly: Lunch Made Easy: MOMables Monday, Silly Monkey! 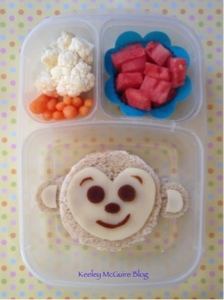 Lunch Made Easy: MOMables Monday, Silly Monkey! To make our sandwich friendly for Little Miss, I used SunButter in lieu of Almond Butter and gluten & nut free bread slices. Yummo! Little Miss loves SunButter & Bananas so this sammie is SURE to be a hit! 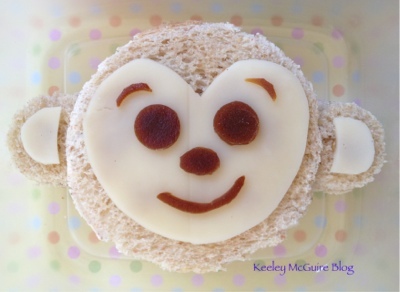 The monkey face is a play on the fabulous monkey that VeggieBento made. Little Miss also has in her EasyLunchBoxes container watermelon dices, cauliflower florets, and baby carrots. Want to learn more and see more from MOMables? Click here to see a FREE sample menu! There's also a weeks worth of menus available for FREE by clicking this link - HERE. Nothing to fill out - just a free PDF download so you can see how it works and give it a try.